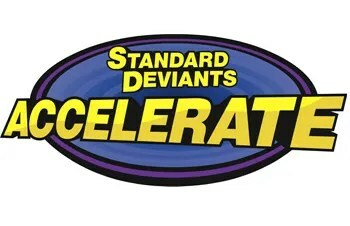 For the past few weeks we have been investigating the Homeschool Courses offered by Standard Deviants Accelerate . We were given the opportunity to select any classes from their Homeschool Core Curriculum. Our family loves science and nature studies, but I have had a hard time finding a curriculum to pull Jon through. I do mean pull, tug, and drag. He found a living book curriculum for Chemistry and Physics, but we have not found one since. We are using a DVD Series for our Biology this year, but we’ve watched it before with big brother, two years ago, so he is a little familiar. I started logged in as the teacher and looked through the courses. 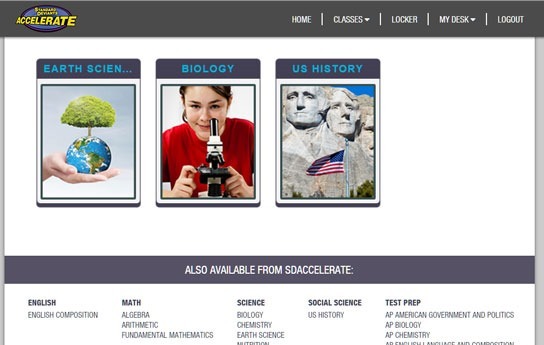 I added Earth Science, Biology and US History as my classes. When I added them, the screen gave me a code to confirm my choice. I’m not sure if this would be different if you didn’t have the whole package available. There are prices for classes ala cart, or for all of the classes. You can pay upfront, or they have bite size monthly payments. Next, I added my student. My son doesn’t have an email account that he checks regularly, so the quick customer service response suggested that I create a fake email address for him as a log on name. We’ve looked at several online curriculum programs, and have not been able to find one that Jon likes. He’s an active 14 yr old boy. He, um, well, doesn’t pay attention to long speeches. He looses comprehension if he has to read for longer than 25 minutes. He doesn’t quite take the time to really learn how to log into programs and remember exactly where he is for the next lesson. These are areas that an online curriculum needs to solve. When Jon logs in, he sees the same screen as I did above. 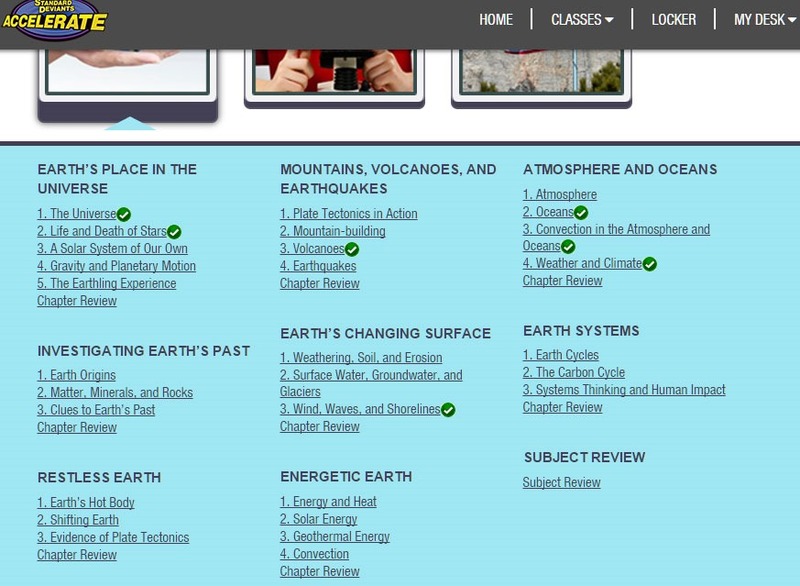 He may click on a class, Earth Science shown above, and choose a lesson. I’d assume that it would be better to go 1.2.3.4.5 – but, ya. Jon. I was in the room when he did the lessons. They are stand alone. It didn’t feel like he couldn’t do the work because he started on #2, or jumped into Wind, Waves and Shorelines. He can quickly see which ones he’s worked on. Once he clicks on a topic, there is a five tabbed screen ready. You may click the video, print a full transcript, or scroll through the transcript as the video plays. There is a box for the student to take notes in and ‘save to locker’. More on the Locker in a bit. The film is entertaining and informative. It switches character and bounces from serious academic, to serious humor. There are enough screens with the words/formulas/diagrams to help a visual learner soak in the knowledge. There is direct spoken language to help the auditory learner. There is enough of a pace to keep the distracted learner involved. Then the student clicks through the tabs. A list of vocabulary words, a diagram / puzzle to put together matching the words with an image, and then a quiz. The quizes we have taken so far have not been long. 5-10 questions. So far – we only knew to Print the Work. Since I’m in the room, we’d go over the answers together. Since I listened to the video, and am relatively familiar, I graded it. I had been confused as to how a teacher would know the answer for the first few weeks. Then a friend came over and I was gushing about the program as a great alternative to her online homeschool curriculum program – and we sat down together to figure out the teacher side of it. See that line up there? Throw It Against The Wall And See If It Sticks! ?? That’s the SUBMIT button for the quiz. 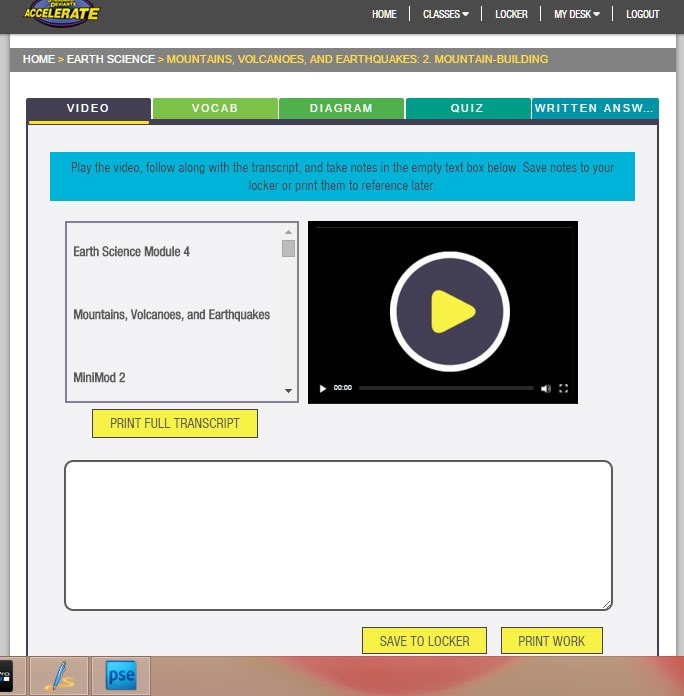 Once you click that, it tells you how many you have RIGHT, and then gives you the highlight for the wrong/right answers and a clip of a video to help you re-learn or remember. Super Cool. This way, it also submits the score. The Written Work is pretty subjective. The teacher’s grading tool has a pretty detailed rubric to let you know on a scale of 1-5 how their answer would pan out. Most of the way through, I wasn’t interested in the teacher portion, but when showing my friend we wanted to figure out how to use the program if I wasn’t in the room. The student types in the answer and clicks Save to Locker. Oh – on the graphic above? See the circle to the right? If the student has a question for the teacher, that is how they send it. My friend is at her work place, while the daughter is at home. That would be a simple way to send a note in the program. Or if she has a question in class, she can ask it there, and mom, or the teacher could know. 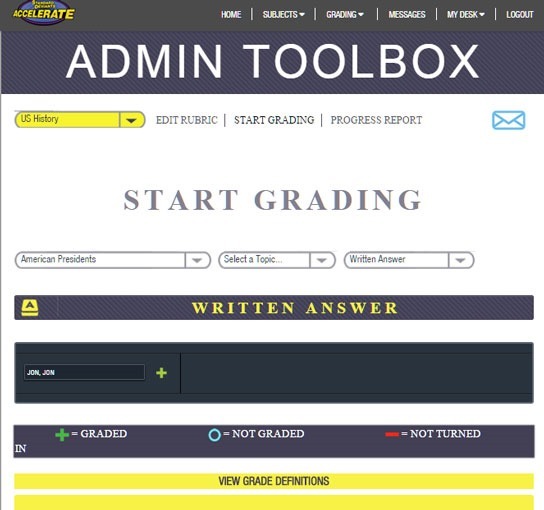 Then you go to the Admin Toolbox and Start Grading. You can select the student, and see what is Not Graded. Clicking on the rubric form (not shown) and submit will give the green plus sign of Graded. If it is not in the Locker, it won’t show up on the from to Grade. The locker above shows their progress reports, written response, diagrams, video notes – and the click to Get to Class. I had been a wee bit frustrated with the screens. I’m used to a pop up telling me that my request to submit went through. One good note for that – is that this is a program that runs well on my android phone and on my tablet. If I had a ton of pop ups every time I clicked something, I’d probably be writing – it’s too hard to use on my phone because of the popups. Ha. I was also frustrated with the grading. Once we figured out how to submit the quizzes, that was fixed. There is a ‘discover as you go’ learning curve here. The friend that helped me then showed me her intense program, and it was even harder for me to figure out – so I think that’s par for the course of a pretty indepth program. The actual using of the courses is extremely easy and user friendly. 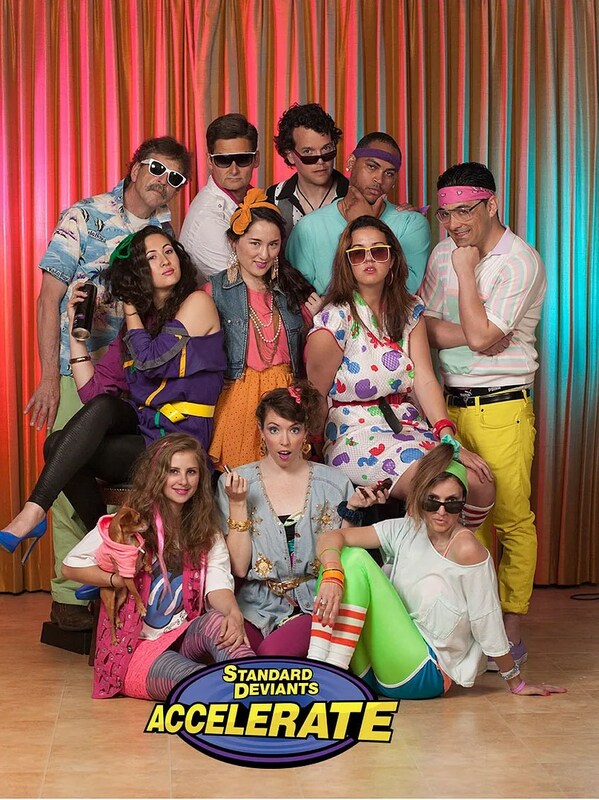 See these cool cats on the left? (or above if you are on a tiny screen) They’ve been the teachers for Jon this fall. Folks ask me all the time. How will you homeschool high school? I don’t have to. I just need to find great resources. We’ve found video tutors to be the bomb diggity. These folks are intense, passionate, funny, and project a feeling that they really care about the student understanding the academics being shared. Jon has called me over every other episode to have me watch something funny, or something he didn’t know. There are so many details. Yes, we know about weather, oceans, waves, and volcanoes, but not the direct micro particulars and vocabulary. We will still watch the Biology Science DVD curriculum we purchased, as it has a creation based origin and gives God credit for the wonders that abound. SDA had an evolution big bang mystery introduction to origins, but didn’t dwell on it. I think this will continue to make an excellent supplement this year. The two together will provide all our science goals for the year. I played around this week with US History. It has a longer video and a lot more detail. I’m going to have Jon do a few videos this week with US History and see if he can remember the information. Here’s my main plea if you are still reading this. If you are using a curriculum that isn’t working, that you paid too much for, or that you received for free from a charter type situation from the State – check this company out. Choosing your own curriculum gives you freedom. The main point of home learning is freedom. Freedom to learn what you want today. When you want. How much. Freedom to take a week break, or to do 3 lessons in a day. This is a comprehensive all inclusive academic curriculum of the core subjects. I am quite sure that if you used it, you’d be able to pass the state testing. If you have fears of ‘not doing enough’ or fears of winging it – this is an excellent option. 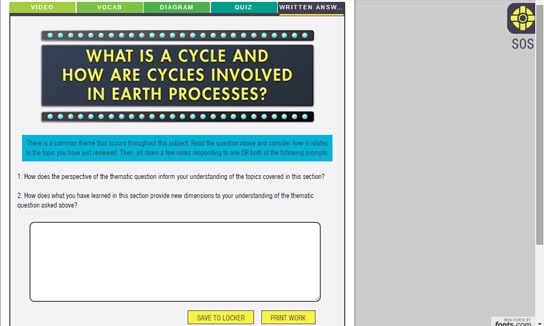 This entry was posted in Computer, Reviews, Schoolhouse Crew, Science and tagged core subjects, hsreviews, online curriculum, online homeschool. Bookmark the permalink.